Cape Town: How do you stop 4 million people from running out of water? The reservoir of the largest dam in Cape Town is almost completely dry. In 2015 and 2016, the city had a bad drought. The amount of water in Cape Town’s six reservoirs fell. The drought was supposed to end in 2017, but rain never came. The government began to worry that all the water in the reservoirs would run out. What is the government doing to stop the water from running out? To solve the problem, the government started new projects to get more water. They began building desalination plants, which remove salt from ocean water. They also started building a water recycling center and new ways to get water from underground. These projects were supposed to be completed before any major crisis. However, the projects moved slowly and the drought has continued. Water in the city’s reservoirs kept decreasing. The government really wanted to complete the projects before the city ran out of water. It was a race. To win the race, people needed to use less water. The mayor told them to limit their use of water to 23 gallons per person per day. That’s about how much water fills a bathtub. In the United States, a person uses four times as much. Sadly, less than half of Cape Town’s residents followed the guideline. The government was angry: "It is unbelievable that a majority of people do not seem to care and are sending all of us towards Day Zero," said the Mayor’s office. "We can no longer ask people to stop wasting water. We must force them." The city was losing the race against time. The government decided to make the policies more strict. They reduced the usage limit to 13 gallons per day. To help people understand this limit, public service announcements showed how to manage life with that little water, like taking sponge baths instead of showers. To get more people to follow the rules, the mayor added new penalties. A tax fined homes for exceeding their limit. It also became illegal to wash cars or water home gardens. The city started installing devices to automatically shut off water at houses using the most water. Many residents were mad at the government. They thought the government was at fault. One person, Shaheed Mohammad, complained, “The city is completely mismanaging the water. They are not fixing the leaks. They are not reducing the pressure in the pipes.” Residents felt that the government waited too long to react to the problem. Time is running out before Day Zero, but there has been some positive news. 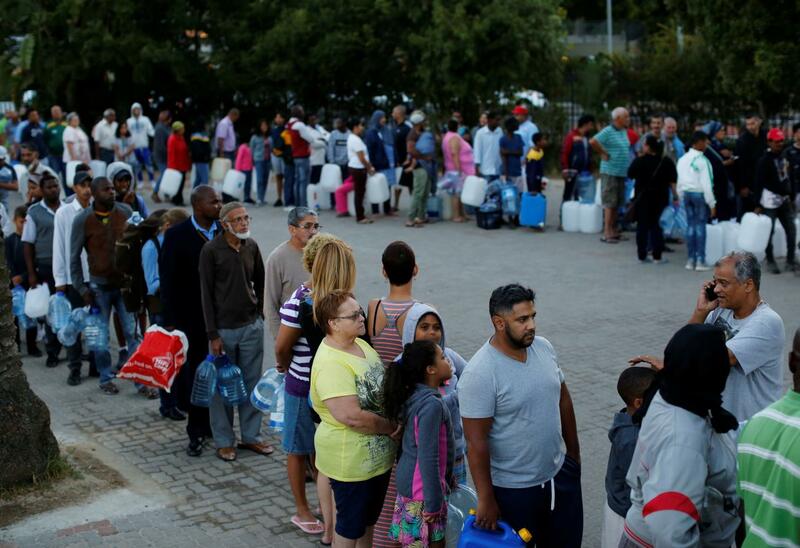 Recently, a nearby town decided to give Cape Town water for 60 days. The new policies have also started to decrease water use. In early February, Day Zero was moved back almost a month. What happens on Day Zero? Moving Day Zero back was a good sign. More still need to happen. Many of the water projects are delayed. They will be finished around August so the water has to last until then. Day Zero helps the water last longer. Once it starts, Cape Town will have 150 more days before completely running out of water. On Day Zero, the faucets for homes and businesses will run dry. People will have to go to one of 200 water collection sites around the city to get water. They will be able to collect 6 gallons per person, half of the current limit. Each site would serve about 20,000 people, so the lines will be long. If people use less water every day, Day Zero can move further out. But unless major change happens, Day Zero will arrive. People in Cape Town have already started using the water dispensaries. Tell us what you thought of this article by completing this survey! Onishi, Norimitsu, and Somini Sengupta. “Dangerously Low on Water, Cape Town Now Faces 'Day Zero'.” The New York Times, The New York Times, 30 Jan. 2018, www.nytimes.com/2018/01/30/world/africa/cape-town-day-zero.html. Said-Moorhouse, Lauren. “Cape Town Cuts Water Use Limit by Nearly Half.” CNN, Cable News Network, 1 Feb. 2018, www.cnn.com/2018/02/01/africa/cape-town-water-crisis-intl/index.html. Think Water, Government of Cape Town, www.capetown.gov.za/thinkwater. Ziervogel, Gina. “Op-Ed: Cape Town's Bid to Lock Down the Water Crisis.” Daily Maverick, Daily Maverick, 20 Dec. 2017, www.dailymaverick.co.za/article/2017-12-20-op-ed-cape-towns-bid-to-lock-down-the-water-crisis/.